004 – The Lost Boys | All Eighties Movies. All The Time! This week Gidgit Von LaRue and the Angryman enjoy one of their favourites – 1987’s Lost Boys! Honestly Santa Carla would be great if it wasn’t for all the Vampires. This entry was posted in Podcasts and tagged action, comedy, lost boys. Bookmark the permalink. Grt podcast Angry and Gidget. 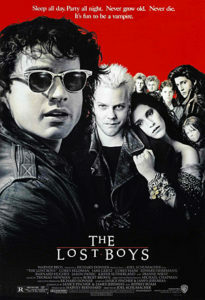 As a resident of that area I do attend the yearly Lost Boys festival and great to hear u mention it. Awesome podcast too to the movie. Sent the links to a few bros into the movie. For sure a goth movie. Nailed that. Fantastic podcast both of you. What great chemistry you both have and such love. I adore this movie and have listened to this podcast twice. I’m going to show my 14 yr old daughter this film this weekend then let her listen to your podcast! Thank you.